One room in Patrick and Loreen Benner’s South Burlington home is kept locked. Behind the door, a motley collection reveals the couple’s passions. Patrick — who’s a justice of the peace and runs a firearms training academy in addition to his main job at the Chittenden Solid Waste District — has statues of eagles, telephones shaped like motorcycles, and a red, black and white clock promoting the National Rifle Association. Loreen has cookbooks, lots of ’em — and this is just a small portion of her collection. The champion baker owns nearly 3000 volumes — more than enough to qualify her as Greater Burlington’s cookbook queen. Benner keeps about 75 favorites, including Miss Mary Bobo’s Boarding House Cookbook, on a three-tier wooden shelf in the center of the locked room for easy access. Across the way, in what used to be her son’s bedroom, she stores more of her hoard. The volumes range from paperback booklets like those sold at the supermarket checkout to Benner’s crown jewel: a tome from 1876 that lies swaddled in plastic in a pretty wooden box. The door to this room stays closed, too, to keep out the couple’s eight cats, all of different ages and breeds. Katie, a fluffy Pomeranian with “separation anxiety,” is allowed in. The source of the bounty of books is no great mystery — many are castoffs. Benner, who works at All Cycle, a division of Casella Waste Systems, buys about a third of them. Her husband brings the other two-thirds home from his work at CSWD. When the heirloom went missing, Benner recalls, her mother was devastated. One year, the Benners decided to find her another copy as a Christmas gift. They easily located one online, and Benner’s mother was thrilled to receive it. “That’s when we started collecting,” Benner says. “We went on websites and to Amazon.com; we went to eBay and started bidding on books.” Back then, she notes, getting great deals on the web was pretty easy. But Benner says she’s watched buyers get more savvy over the past decade — now, a valuable older book gets plenty of attention. Unlike the online bidding, Patrick’s task has gotten easier. Now, many customers know to bring their food-related items straight to him. Although Patrick is not a cook himself — “He has franks and beans that he cooks on New Year’s for us, but he’s not the culinary artist” — he’s very supportive of Loreen’s efforts, she says. She backs up her statement with a wave at the walls of her library, covered with funky, cooking-related antiques that Patrick has brought home. There are copper molds shaped like seashells, hearts and fish; porcelain models of the Pillsbury Doughboy, and old-fashioned egg beaters, graters and tongs. And then there are the books. Some are glossy modern productions, others corporate publications such as The New Joys of Jell-O and Forrest Gump, My Favorite Chocolate Recipes. Some books are true curiosities, such as The Gasparilla Cookbook put out by the Junior League of Tampa in 1961, which commemorates the city’s annual pirate festival. On its cover, a swarthy man with a bandanna, 5 o’clock shadow and a pair of hoop earrings proffers a platter. The author also explains that Soyer’s methods allow single working women to “provide themselves with a simple and sufficient meal in half an hour,” since otherwise their delicate systems might be too exhausted by a day’s labor to sup on more than “a bun and a glass of milk.” Perhaps paper-bag cooking was the ancestor of the microwave? Oddities like this have value even when they’re never used for their recipes: Each one captures the distinct feel of a distant time and place. Finding any particular cookbook can be a chore, though, Benner notes, since they’re not organized. “I thought about doing the Dewey Decimal system, but that would drive me crazy,” she says. Benner does maintain a printed “Master Cookbook List” in a three-ring binder, with each page numbered and protected by a plastic sleeve. She groups the books not by cuisine type or age (though the real antiques are dated), but as “hardback,” “paperback” and “miscellaneous.” The last group includes items such as VHS tapes and CD-ROMs. Cooking has been one of Benner’s hobbies since she was 9, she says: “My mom started showing me how to cook, and I said, ‘Mom, just sit down.’ I’ve been cooking since then.” In the late ’90s, she began entering cooking competitions at the Champlain Valley Fair. The walls of the couple’s narrow hallway are covered with ribbons neatly tucked into frames, alongside other fair memorabilia. In cooking competitions as in collecting, Benner is savvy. The first year she threw her baked goods into the ring, she recalls, she got third place for pumpkin or zucchini bread; she can’t remember which. Then a friend advised her to add nuts. “I think walnuts are the foulest thing on earth,” Benner says. “I put walnuts in and the next year I won second place.” She’s also scored big for buttery layer cakes and chili. 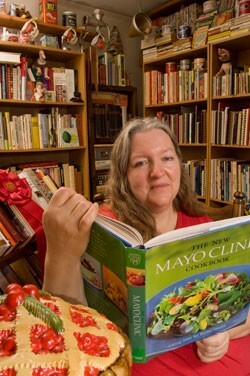 Someday, Benner hopes, other collectors will be remarking over her cookbooks — a planned series for youngsters called Cooking With Ruby. “I got the idea two years ago when I was walking the dog,” she recalls. The books will be “about a little girl who cooks different things with her mom.” Appropriately, Benner and her grown-up daughter are working on the series’ first volume, which takes place on Halloween. After whipping up themed treats with her mom, the eponymous Ruby enjoys a party stocked with the fruits of her labors, then goes trick-or-treating. Most of Grandma’s recipes probably still taste pretty good — in cookery as in other realms, there’s much to be said for reusing and recycling. Just be sure to stock up on butter-coated paper bags.